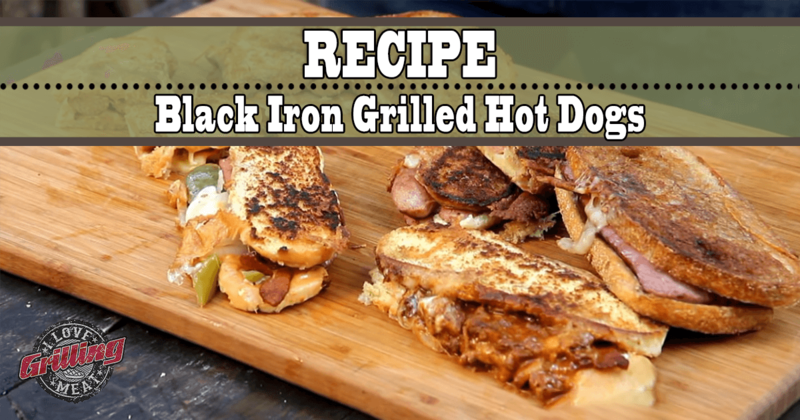 This black iron grilled hot dogs recipe is not for your everyday cook but rather, more like every few weeks. This is simply because it’s such a mouthwatering dish that your taste buds will need at least a few weeks to recover. Step one, prepare the hot dogs by splitting them across the middle with a knife. Next up, get that grill started! Once you have a good fire going, place the cast iron pan over direct heat, and melt 2 sticks of butter in it. If you think that’s too much, stop right here! This recipe is not about eating healthy- it’s about enjoying what you’re eating. What you want to do is poach the sausages in the molten butter, get them nice and hot. Then pull the pan off the heat, and place the sausages back on the grill, this time directly on the grates. You only want to give them a sear at this point since they are already cooked. Time to bring out the flat pan. melt some butter on it, and give the hot dog rolls a toast. At the same time, cook the bacon strips. When everything is ready, assemble the hot dogs: the sausages go on the bread first, then some bacon, and top with shredded cheese, before placing the top bun. Now here’s a trick: while the hot dogs are still on the grill, get the still hot cast iron pan used earlier, and place it on top of them to push them down. This will melt the cheese and press the hot dogs into a more manageable shape. After 2 minutes, flip and repeat. And that’s a grilled hot dogs recipe for you! Hope you enjoy!